By Peter Anderson 22 Comments - The content of this website often contains affiliate links and I may be compensated if you buy through those links (at no cost to you!). Learn more about how we make money. Last edited August 17, 2018 . As the economy and the stock market continue on their downward slide saving money is becoming more important for families across the country. We've all probably heard a lot of the conventional tips on how to save money – like not eating out as much or cutting back on personal fun money, but there are other less conventional ways that you can save money. Today I thought I'd list a few of those. While you may not want to try all of these, hopefully this post can serve as a reminder that there are always ways to find more money (or make more money) in your budget. When you're looking for ways to save, these ideas may not immediately come to mind first, but rational people are doing these things to save money. 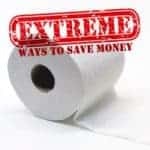 Stop using toilet paper (and/or other paper products): Yeah, I know, great way to start the list – by telling people to stop using toilet paper! While this idea is admittedly not for everyone (including me! ), there are plenty of people forgoing traditional toilet paper in favor of what they call “family cloths”. Basically you just buy a bunch of extra washcloths at the store for cheap, and then use those for wiping instead. Then you set up a small pail of water with bleach solution in it, to place your used cloths. Just pour the bucket into the wash, spin out the liquid and then wash with hot water and bleach. Also save money by opting to use non-paper products. Skip the use of paper plates, paper napkins, etc. Flush using less water: Some people will save a few dollars a month by flushing using less water in their toilets. To do that they'll place a capped jug filled with sand or rocks in the back of their toilet tank, displacing enough water in the tank to save 10 or more gallons per day of water. Over an entire year that can mean savings of $90-100. Use in conjunction with the first tip to save even more! Dumpster diving for food and other useful items: This is another one that I'd probably avoid mostly because of embarrassment and/or concerns about food safety. There is a whole community of folks online, however, that like to brag about what things they found in the trash this week. People will furnish their entire homes, and create entire meals from things found dumpster diving. It's best to be careful on this one, however as sometimes dumpster diving can be illegal in certain areas, or when dumpsters are on private property. Make your own home products: A lot of people are starting to make their own home products, everything from shampoo and dish detergent to mouthwash and fabric softener. There savings you see from making your own products ( many of which are essentially the same or better than store bought) can be pretty big! Forgo having a car: For many people this might not be feasible if they live a long ways from their place of employment, or if there isn't public transit available, but many people are living without a vehicle in order to save on gas, insurance and car payments. Options to replace having a vehicle include riding public transportation, carpooling and cost sharing as well as biking to the place you need to go. There are also creative ways to get rid of the need for a car, like ordering groceries online, renting a car short term if you really need one, or riding a taxi. This way to save money works best, however, if you're living in a urban center with lots of public transportation options. Buy your groceries farm direct: Often you can buy your groceries direct from the source, or go in with a co-op group to purchase vegetables and other groceries in bulk direct from local farms. Live in a smaller house (or even a tiny one): These days people more often will talk about wanting to move into a bigger house with more amenities and space. Be counter-culture and move into a smaller house that is simpler, costs less and has less expenses associated with it. Pay it off before you move in! 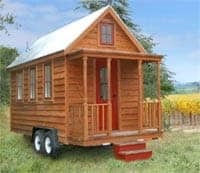 Many folks are even deciding to lessen their impact on the environment by living in a tiny house. While I might not go that extreme, it is an option. Roast and brew your own coffee: My brother opened my eyes to the fact that you can roast your own coffee and save a ton of money. Coffee costs have gone up in excess of 90% or so in the past year. Roasting your own coffee can save you a ton of money. Just buy the green coffee, buy a cheap new or used popcorn popper and follow tutorials you can find online. Never buy new. Buy everything used or secondhand: Some folks will refuse to buy anything when it's new – instead opting to buy things when they're gently used or a year or two old. You can find just about anything used on Craigslist or ebay nowadays – anything from an Xbox 360 to a car. Buying used will save a ton of money! Don't use subscription services, or ask for price reductions on current services: If you can help it avoid using subscription services like cable TV, cell phone service, newspapers, magazines and lawn mowing service. Instead opt for free alternatives online, do it yourself, buy pre-paid services or buy things only when you really want or need them. If you need a certain service ask for a price reduction, or consider switching services to save. So there are a few ways to save money in less than conventional ways. While I won't be doing all of these – or even most of them, I'm sure to do one or two. 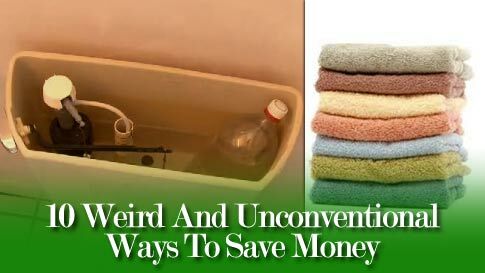 Do you have any weird or strange ways of saving money? Any that you would avoid at all costs? Tell us about them in the comments! Re: Not buying toilet paper – My grandpa claims that when he was a poor boy growing up in Kentucky, they used old corn cobs as “toilet paper.” I have to admit, both the corn cobs and the “family cloths” sound about equally appealing to me, and neither as charming as Charmin. Excellent and timely list Peter. Betsy and I have implemented many of these and will be releasing our ebook teaching others how to make ALL their own natural homemade products on September 1st! Sounds like an interesting read, Matt. Just a few notes – good list all in all. It is hard to get to a farm if you don’t drive a car. We’ve found prices are cheaper @ the farm than via a 3rd party or at the farmer’s market. I’ve been telling people about the toilet paper things all day. Nobody bought into it. Buying things second hand is probably the best one in that list in my opinion. If you shop around enough, no matter what item you’re looking for, you can bet there’s a good deal around somewhere. Even if it’s not brand new, who cares, as long as it gets the job done. If you do this for a full year you’d be amazed how much money you saved. I came across the ‘family cloth’ thing a few months ago when researching ways to save money naturally. It brought a very heated discussion when I mentioned it on FB, and now my cousins and I will comment ever so often on status updates about having some nice soft flannel to share(the person recomending the family cloth said to use some nice soft printed flannel because it was ‘fun’). As far as everything else, my hubby and I do almost all of them(we do have 2 cars…both paid off…due to our work circumstances) we are a family of 3 living in a 2 bedroom, 1 bathroom house, and I am borderline ‘extreme couponer’ with a stockpile of food and toiletries to last about 3 months that cost aproximately $400. We buy local and secondhand whenever possible. As far as the ‘secondhand toothbrush’ comment: I haven’t paid for a toothbrush or toothpaste in over a year. I ‘buy’ them on sale with coupons that double at my local store. If you do your research, you can get a lot of things that way with coupons! Instead of “family cloths” which seems too gross, how about a bidet attachment for the toilet seat? I haven’t tried this, I think you’d still need a little paper to dry off. Instead of putting a bottle of sand in your toilet tank you can change the amount of water in the tank by adjusting the floatie with its knob to lower or rise. The floatie could rise sooner to stop the water from flowing. I fail to see how flushing bleach into our enviornment benefits anyone, and using fossil fuels to heat the water for the washer and dryer is NOT saving money. I like the secondhand idea. There are some nice thrift stores in my neighborhood where I’ve upgraded my clothing with new-looking shirts made by Gap, Alfani, Van Heusen and even Ecko! I’m very picky- I pull on all the seams, hold the shirts up to the light and look for stains and small tears. For pants I rub behind the knees and pull on the threads. It might even take me two hours to get it all done. But I can’t tell you how many new-looking shirts that I’ve bought for less than $4 that normally sold for $40. These are a bit less “objectionable” than dangling upside down in a dumpster. Foraging and curb gleaning. We have wild raspberries and mulberries growing in woods nearby and all kinds of greens. A friend plans to take a few of us out to hunt pawpaws in the fall near her home. I knew of a potato farmer who would have loved people glean his fields for potatoes left by the harvesting machines, but he had no takers. People in our town regularly leave furniture out or boxes of unsold yard sale goods on the curb for any takers. If you’re in doubt knock on their door. We found a garden hose winder and compost bin that way. Both in great shape and something we had been considering buying. Another way to economize is by “putting the word out”. You might end up in an informal bartering setup, like a babysitting exchange, or furniture sitting situation, to save someone having to pay for storage. We loaned some kids clothes to a neighbor as their son was between our two in size. We got a box back with our stuff plus the outgrown things his mom had gotten other places. Then there are the more acceptable free options of craigslist and freecycle. I recall an older lady at church telling me to never refuse a gift from anyone. “You may have been given it to give it to someone who needs it.” Not only do these methods save money but they can build a sense of community. Thanks for your insightful comment Tom. Have a great day! Hey, some of these aren’t so odd. I love making cleaning products for my own home. They work just as well or better than store-bought products, and I have saved quite a bit. Thanks to a big jug of white vinegar which I dilute with water, I haven’t bought window cleaner in close to 3 years. Vinegar is much cheaper, doesn’t reek as much as those ammonia cleaners, and works like a charm. I also make my own paste cleanser for the sinks and counters, and use borax to scrub the tub. My favorite resource for this stuff is a book by Jill Poitvin-Schaff: Greenup Your Cleanup. As a crafter, I also get a lot of making my own holiday decorations. You should see the origami ornaments that have been gracing my Christmas tree for the past 20 years! Try it. I’m just discovering the whole world of buying used items and will be starting up on Freecycle pretty soon, since we have a storage unit full of stuff we need to clear out. I have found that thrift stores are great sources for halloween costume needs and creative re-use items. My husband and I also barter with neighbors, doing things like pet-sitting. Buying food farm-direct is weird? Really? Do you live near a Dole canning factory or work for Kraft, by any chance? My family can’t really afford a share in a CSA right now, but we do find that the produce at farmers markets nearby is about 1/3 the price of the stuff in the produce section at the grocery stores. Turns out trucking stuff in from California is expensive when you live in Illinois. Who knew? Mr. Anderson, as soon as you have some original ideas or useful links, please post them. Until then, I’m inclined to agree with Tom. Wow, I’m not sure why you felt you needed add that in at the end of your comment. I understand that quite a few people do some of these tips already, but to denigrate me saying I’ve got no useful or original content -that just seems strange. The fact is – most people don’t do these things (even if they should ) and that makes them unconventional.. Others like the TP one just seem weird to most folks even if some people find them useful. Interesting video…I’m a huge penny-pincher, but these ideas seem extreme even to me. I’m not desperate enough to go dumpster diving yet! And I’ll keep my toilet paper too. 1. Air-dry your laundry. I do not have a washer or dryer, so I use the laundromat. I air-dry my clothes in my apartment instead of using the dryer. The clothes don’t smell as nice, but it saves a couple dollars. 2. Re-use plastic lunch bags. I have plastic lunch bag I use for my sandwiches. I just wash the bag everyday and re-use it. That way I never have to buy new plastic bags. 3. Keep your tires well-inflated. I try to check my tire pressure regularly. Well-inflated tires get better gas mileage. Thanks for the video, Peter. It’s always fun to learn about new ideas to save money! I only spend paper money. I save all change. It adds up quickly if you’re on the cash system. Here I am, sitting in the Robertson valley, Western Cape, Republic of South Africa – and I find myself between fits of laughter and moment of inspiration when reading all the replies. For 6 years I lived on a farm in the Nuy wine valley and the only thing that truly motivated me to drive th (short trip) of 30km into town, was the need to buy toilet paper. However the corn cob leave story gave me an idea about how important it is to go the eco-friendly alternative route to cutting houselhold costs. We really do need to move away from “wordly” solutions and head back to the simplicity of being satisfied with what nature and God provide. 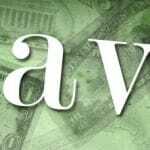 Previous Post: Roth IRA Vs. Roth 401(k): What Are The Differences?